National Highway 55, the arterial road linking Darjeeling with the plains of Siliguri that has remained closed to traffic for nearly four years now, may soon see life returning to normal as the Union ministry of road transport, highways and shipping Nitin Gadkari has reportedly directed the consultancy hired for the job to expedite the preparation of the modified proposal for restoration work. State PWD department sources said Delhi-headquartered Lea Associates South Asia Private Limited (LASA) has been assigned to review and prepare a fresh estimate proposal to be placed before the central government. “The consultancy has already started work and some members of their technical engineering team also visited the construction site last week. The agency is in constant touch with us and we expect the detailed project report and estimates by March-end,” said a source. LASA, a subsidiary of Canada’s LEA Group Holdings, INC specialises in multi-disciplinary planning, engineering and management consultancy. Its clientele profile includes the World Bank, Asian Development Bank, African Development Banks and CIDA, including the Indian government as well as several state governments. The initial estimate by the PWD for the restoration work was Rs82.77 crore and the Centre has already approved the proposal. But factors such as the monsoon and landslides were not taken into account causing delay in work and contractual complications. The PWD, which is the project implementing agency, was compelled to submit a revised estimate. “We managed to complete only about 3-4 per cent of the total work as frequent landslides and rainfall obstructed us. Our revised estimate is Rs166 crore,” said one of the sources. 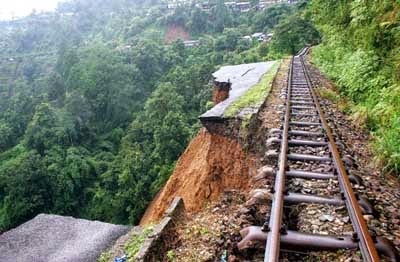 Major portions of NH 55 in Ghayabari were damaged by landslides in 2010 and year later, a 500-metre stretch near the Tindharay train workshop got washed away. This stretch is yet to be repaired although the Ghayabari and Paglajhora portions have been restored. Centre stops PWD NH55 repairs tindharia, LASA to review prepare fresh estimate - LASA, a subsidiary of Canada’s LEA Group Holdings, INC specialises in multi-disciplinary planning, engineering and management consultancy.